Bookcase makeover: Line the back with paper, genius! Hello! Here is the DIY I promised from my bookcase makeover. 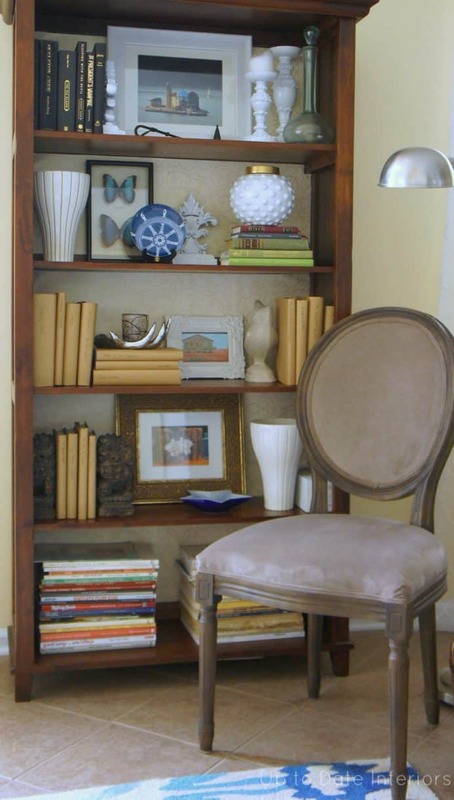 Adding a pretty paper to the back of a bookcase is an easy, inexpensive way to change the appearance without paint. Paper: I used the same wrapping paper from my dresser makeover (you can read about that here). It’s from hallmark and has an 1 inch grid on the back for easy measuring and cutting. Foam board: Dollar Tree friends!! This will be a backer to the paper so you can just slide it into the back of the bookcase without any adhesive. Double Sided Tape: Dollar Tree again and I can personally say it works great. Step one: Measure the height and width between the first shelf and the second. Mark the measurements on your foam board. I used a second foam board to mark my lines with a pencil but a yard stick would work. Step two: Make your cuts. Again, you can use a second piece of foam board or yard stick to guide your box cutter. My bookshelf is wider than the foam board so I had to cut off an additional piece for each shelf. I taped them together with packaging tape. Step 3: Mark the same measurements on your paper, then cut out. Step 4: Attach the paper to the foam board with double-sided sticky tape. I placed three pieces vertically, one on the left, the center, and the right. Start with one side of the paper and smooth out and center as you place it on the foam board to prevent bubbles or wrinkles. So, here is what I started with…. Have you tried covering furniture with paper yet? I would love to hear your stories. Come back tomorrow for Christmas homemade decor! « Christmas Time is Here! What a grea idea. I really like the way the paper gives the book shelf more charater and a unique factor. Thanks for the sweet comment Rachel! It’s really easy to do too. Thanks Jenn! I am really happy with the outcome. Now comes the Christmas decor on it! That dollar tree is the truth and I sleep on it so often. Love the design I have not a one designer bone in my body but love looking at the ones you have on here. This way is so much easier and less messy than using paint. Great post! Thank you for idea! I purchased black and ivory striped wrapping paper at Magnolia and plan on backing my kitchen cabinets that have glass!